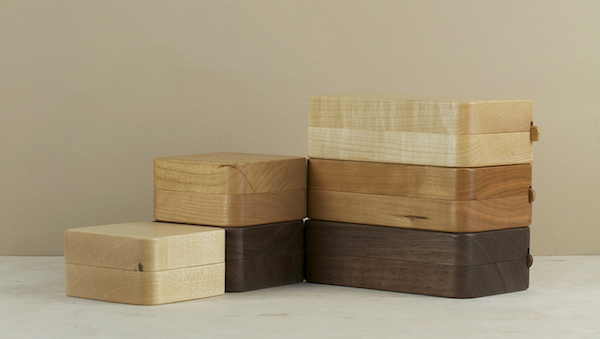 Light maple, red cherry, or deep brown walnut butter cases developed by Oji Masanori in collaboration with the workshops of Takahashi Kougei, in Asahikawa, central Hokkaido, Japan. Kakudo means angle, and describes the way the lid locates naturally and accurately onto the base, a feat only made possible by the astonishing precision of its making. Such attention to detail runs right through the production process. Trees from sustained managed forests of the surrounding Hokkaido mountains are selected before cutting, and the felled timber seasoned through many long Hokkaido winters on the workshop's own grounds, ensuring utmost stability through both its working and long lifetime of use. 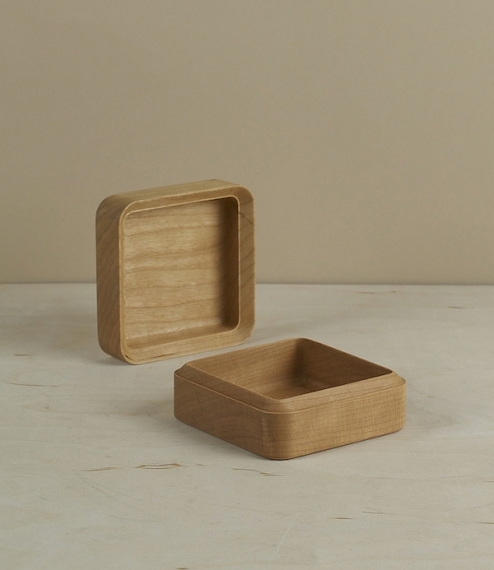 This small cherry butter-case measures approximately 84mm x 84mm x 44mm.